Another swap quilt I’ve finished recently is my contribution to the UK Mini Swap. As you may have guessed, this swap was limited to participants in the UK. Despite having sent and received countless packages from overseas, I still get anxious and worry that my precious cargo will somehow get lost along the way! This swap was a great way for those who worry about missing parcels or high shipping costs to get in on the action. Organised by Nina of Bossy Oz, I was delighted to find out that my assigned partner liked improv. You won’t need a second guess to figure out which route I took when it came to making the mini. I decided to refer to a previous quilt I’d made for inspiration and used a variation of my Drunken Tiles pattern, which made another appearance in this quilt I made last summer. This time I selected a neutral palette for the background, using both low volume prints and solids in cotton and cotton linen blends, with a little more of that beloved Joel Dewberry wood grain print. Rich oranges and teal pop from the center, and from the corners, of the blocks in fabrics that I sourced from my scraps. I used some more screen printed fabric from Karen Lewis, some Cotton and Steel, Oakshott cottons that add a real depth to the quilt and some coordinating Kona scraps that seem to be breeding in the attic! Despite my best attempts to use more of my scraps, the piles never seem to get smaller. With the top coming together quickly, I was basting before I knew it. My partner had mentioned that they liked FMQ so, like the last mini quilt, I took the opportunity to practice my skills. I decided on 4 fern-like feathers, similar to the ones I used on my Oakshott Leaf Skeleton Quilt. I used the width of each column as a guide and really love the fluidity that the stitching adds to the piece. 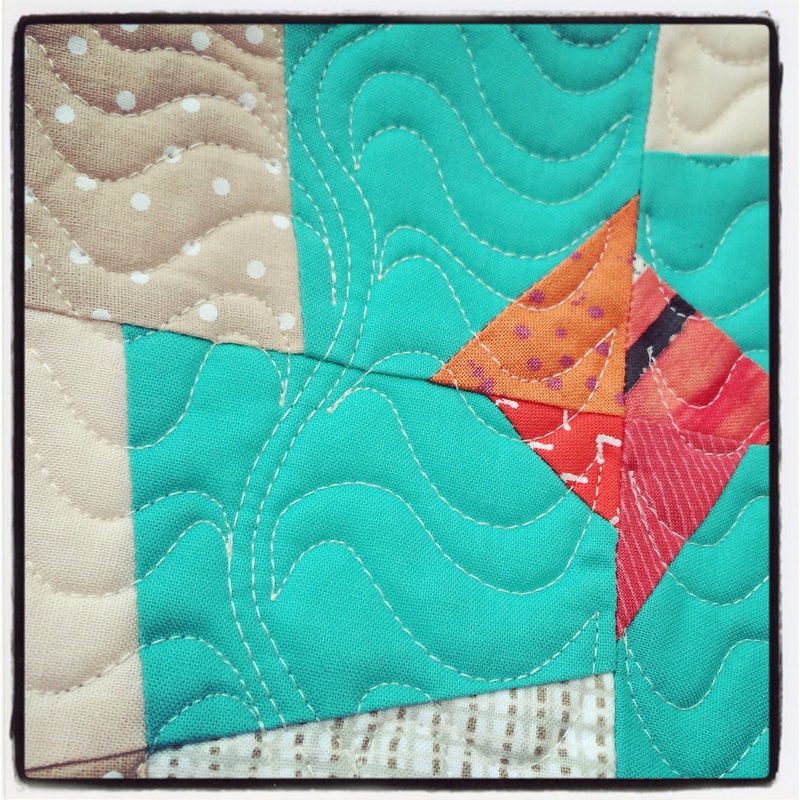 As much as I love matchstick and line quilting, I really enjoy experimenting with FMQ and letting the thread take me to unusual places. 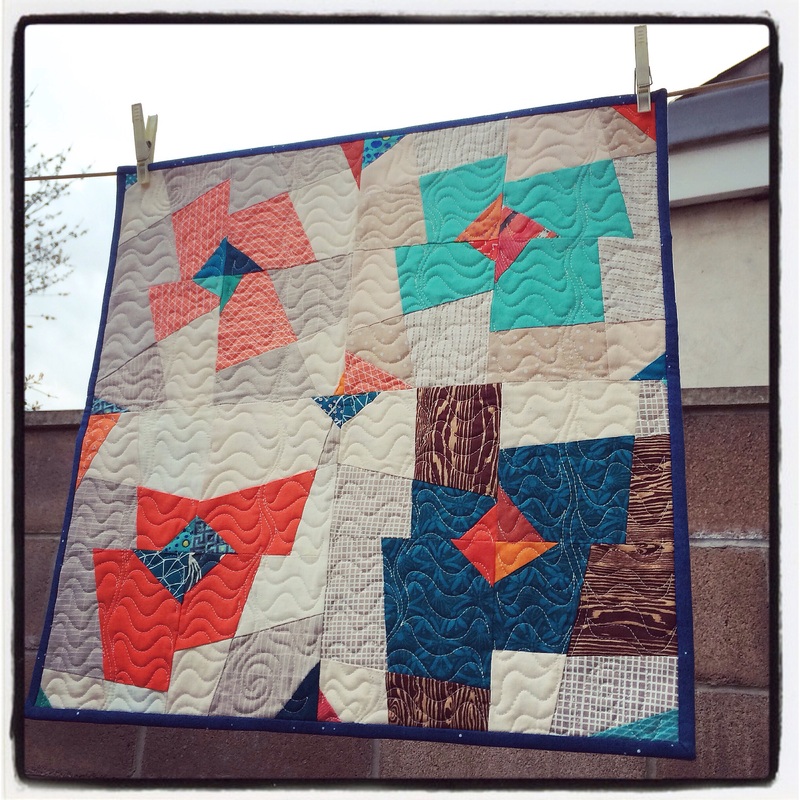 This quilt has been received and is making its new owner smile!